2009 marks a majestic milestone in aviation history - 40 years ago an icon of aviation was born as Concorde "The Queen of the Skies" undertook her maiden flight from Toulouse on 2nd March 1969. The world's first supersonic passenger aircraft was the result of a development phase of 15 years and unique collaboration between the French and British aviation industries - a fact reflected in her name which means unity or harmony. Her elegant, streamlined design was not only an outstanding technical achievement, but also a true design masterpiece. In October 2003, after nearly 35 years of flight and25 years of passenger service, Concorde bid her farewell with a series of flights from Heathrow, visiting Birmingham, Belfast, Manchester, Cardiff and Edinburgh. 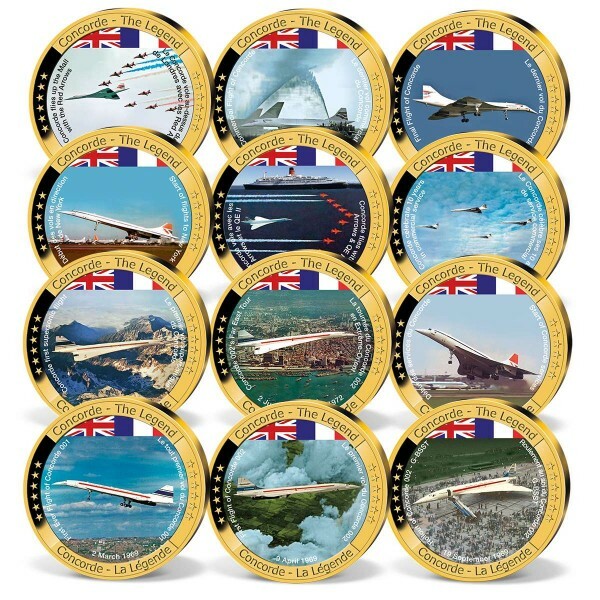 Intro: To celebrate Concorde's anniversary in 2009 this unique commemorative strike set has been minted in proof condition. Each of the 12 commemorative strikes are meticulously crafted and illustrate in stunning colour detail a milestone in Concorde's highflying career. Delicately finished in 24-carat gold plate the commemorative strikes are beautifully presented in a display case - and the entire set is limited to only 9,999 available worldwide - a real treasure for any collector!